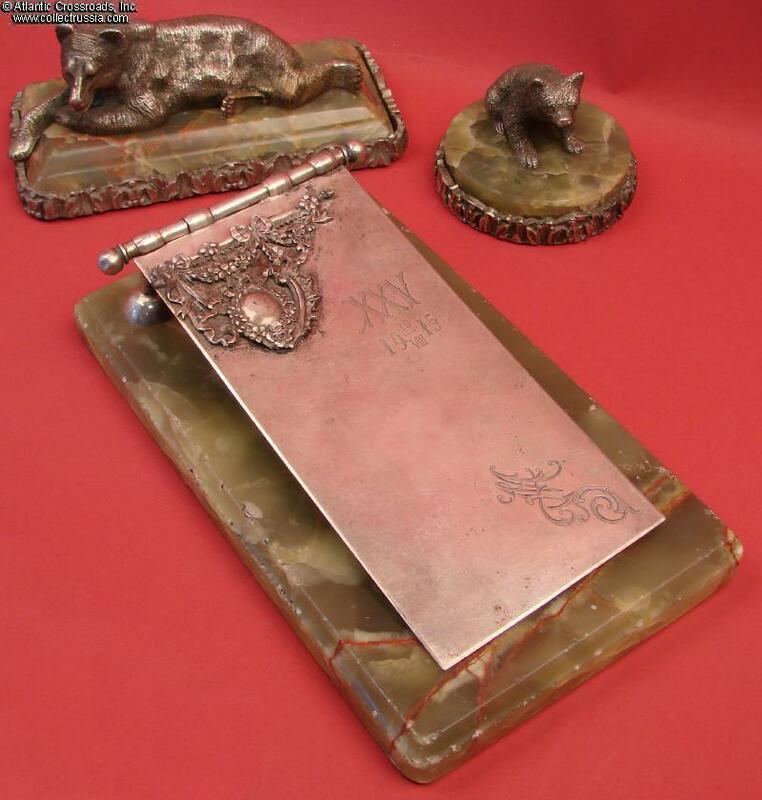 Antique Imperial Era St Petersburg Desk Set. 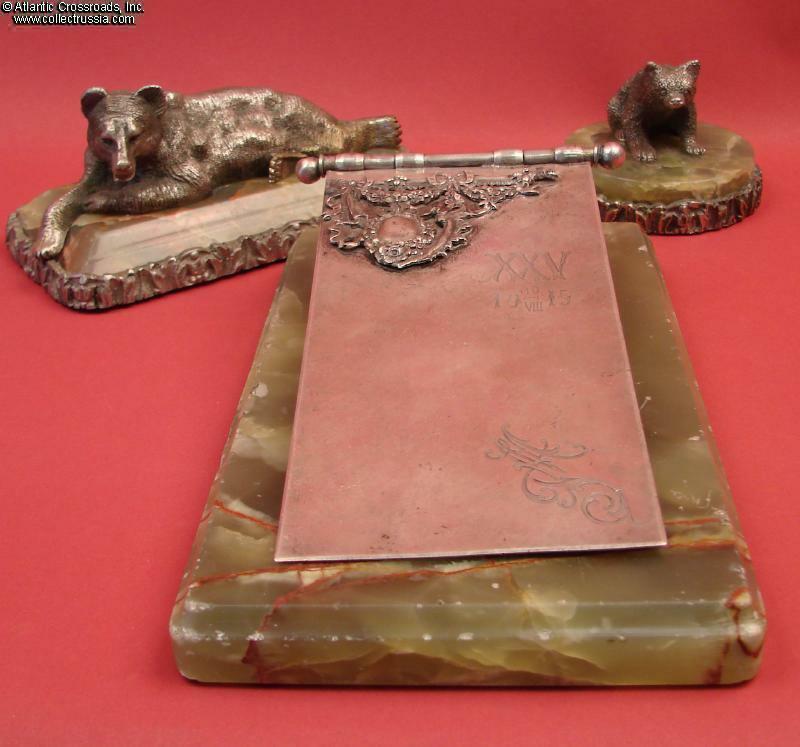 Attractive and interesting desk set comprising a calendar holder featuring an elaborate and very decorative cover (made of hallmarked silver) and two marble paperweights mounted with sculpted bears and decorative borders (the bears and the trim on each made of silver plated bronze). 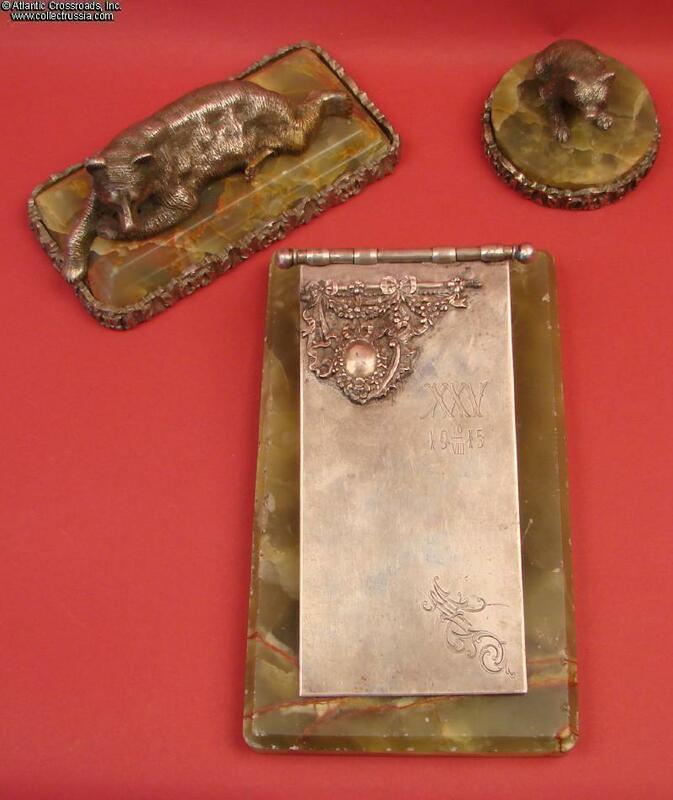 The Calendar Holder : the lid is engraved with an elaborate monogram as well as the Roman numeral for "25" and the date of 10 August 1915; it also has an attractive repousse plaque attached that features flowers, bows, swags, etc. 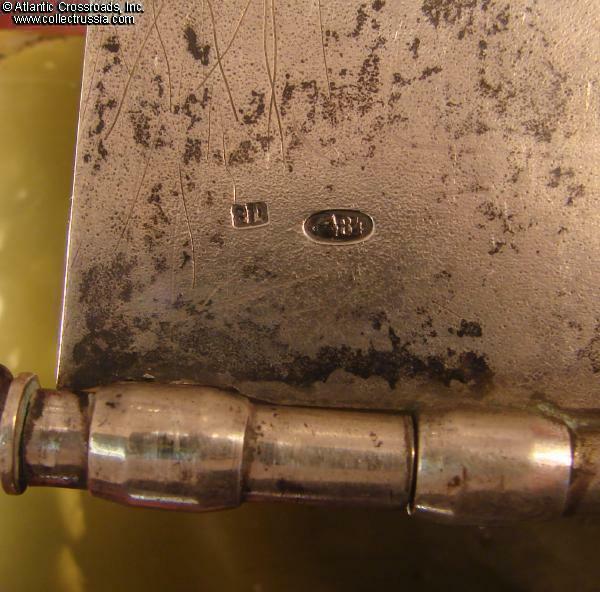 The plaque, the lid, and the bases of the two posts supporting the lid are hallmarked. 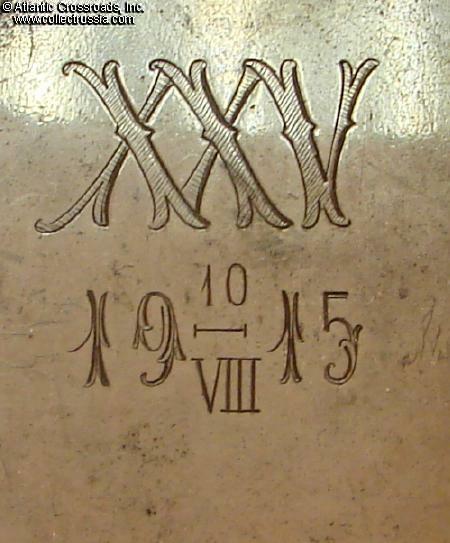 The plaque and the underside of the lid are both hallmarked with Kokoshnik heads & the number "84" indicating sterling silver and show touch marks for a St. Petersburg silversmith whose initials appear to have been "LV". 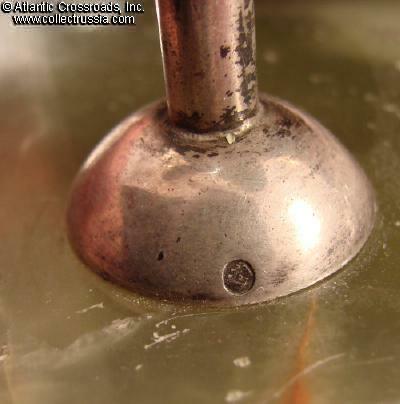 The bases of the struts are also marked with single Kokoshnik heads to indicate that they are also made of solid silver. The metal components of the holder have slightly distended over the decades due to wear but are sound and would still function perfectly. The struts and the hinge measure 10cm from side to side and are 3.3 cm high; the lid is 8 x 16 cm. (Since it is doubtful that calendar inserts are still made for such a holder, a new owner could make arrangements to trim and punch blank paper inserts and then use this as a memo pad holder). The marble base is 12 x 20.5 x 2 cm and has seen wear: there are minor chips in evidence at various points. The underside of the base has had a thin layer of green morocco leather applied. (It is possible that the leather was dyed green after it was applied.) 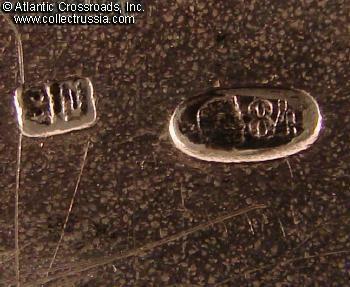 There is a circular impression struck into the leather of an unidentified Russian coat of arms (placed there as if to indicate ownership at one point by a specific noble family). 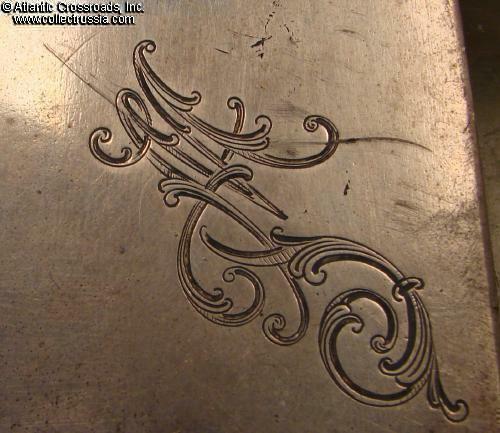 It is our belief that the leather and the coat of arms imprint are not original to the piece but we can neither prove nor disprove that observation. 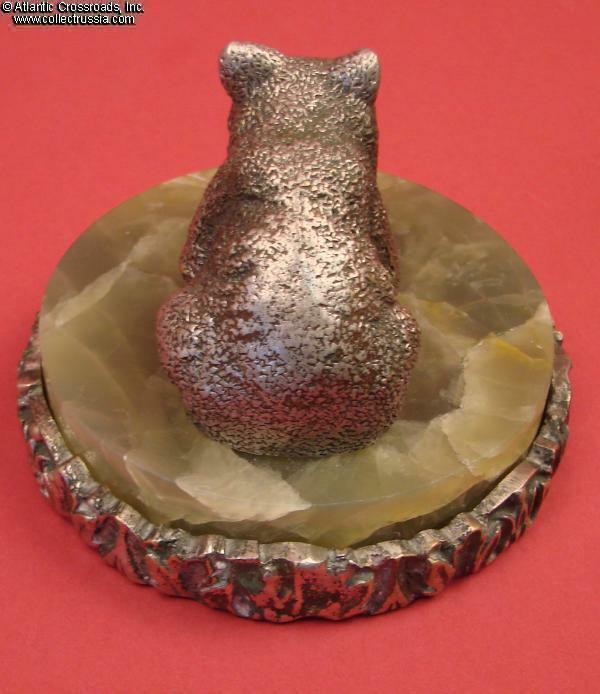 The Paperweight with a Large Bear : the marble base including the silver-plated bronze ornamental trim is approximately 8.2 x 15.5 x 2 cm; the silver-plated bronze bear is approximately 3.6cm tall at the highest point from the marble surface and 14.5 cm long at the longest point (forepaw to hind paw). 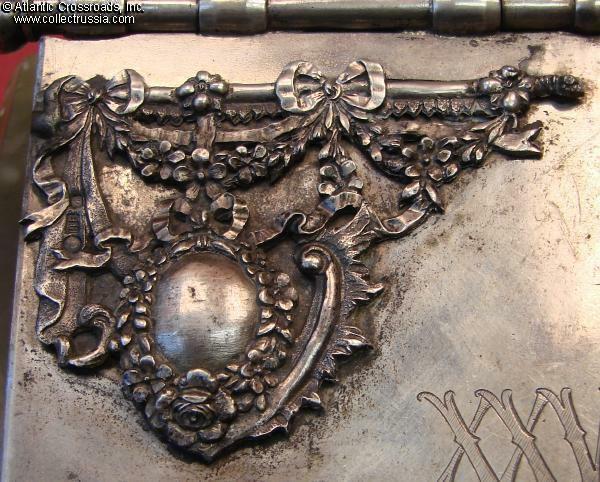 The plating on the border trim has not worn through at any point but the plating on the bear has started to wear through at various points due to handling over the years. The marble, which is virtually identical in coloration to that on the calendar base, shows virtually no wear. 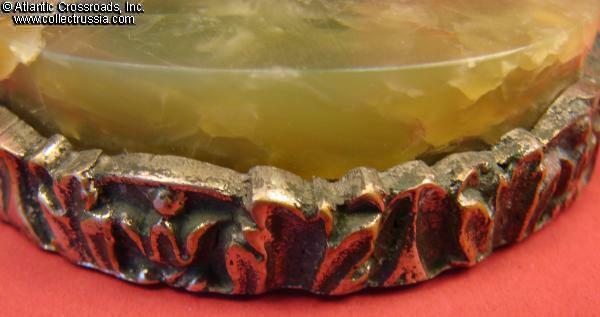 As with the calendar holder, the underside of the paperweight has had a thin layer of green morocco leather applied. (It is possible that the leather was dyed green after it was applied or that a previous owner applied some sort of a green leather polish to it.) 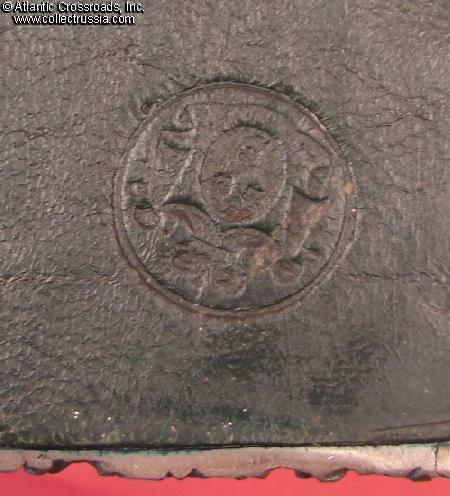 There is a circular impression struck into the leather of an unidentified Russian coat of arms (placed there as if to indicate ownership at one point by a specific noble family). It is our belief that the leather and the coat of arms imprint are not original to the piece but we can neither prove nor disprove that observation. 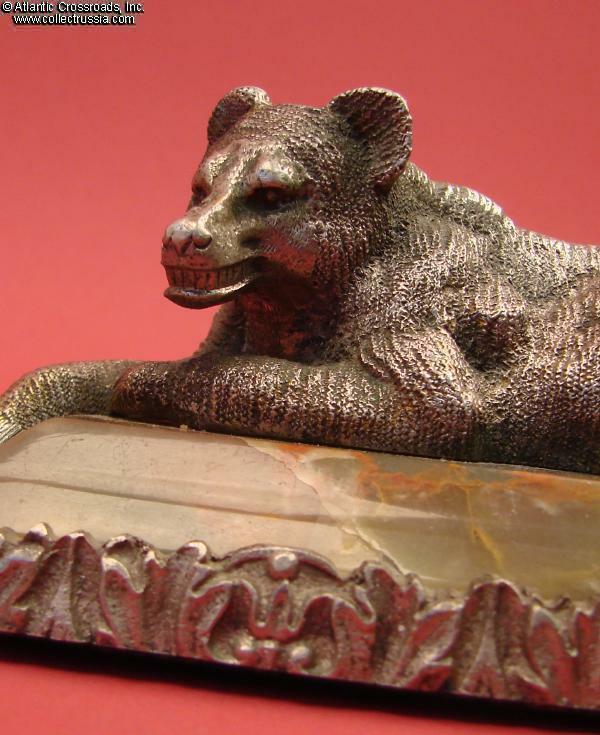 Please note the fact that while the sculptor was quite successful in rendering a naturalistic image of a lounging bear, he chose to give the bear a positively fearsome and hungry grin! 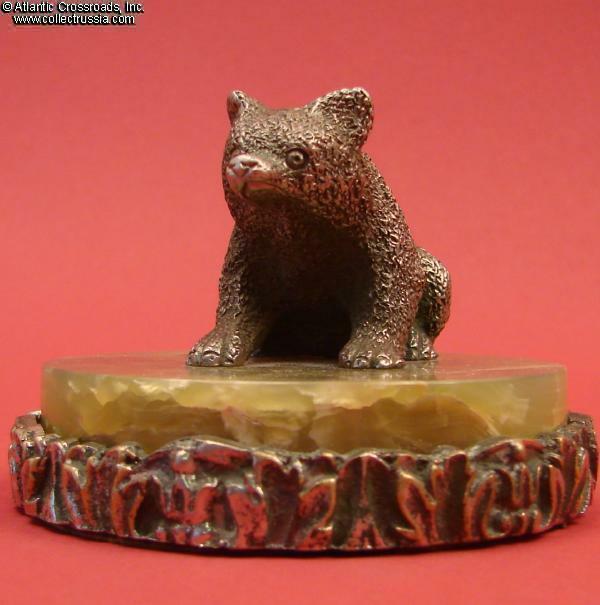 The Paperweight with a Bear Cub : the marble base including the silver-plated bronze ornamental trim is approximately 8 cm in diameter and 2 cm in height; the silver-plated bronze seated bear is approximately 3.8 cm tall, 5 cm long and 3 cm wide. 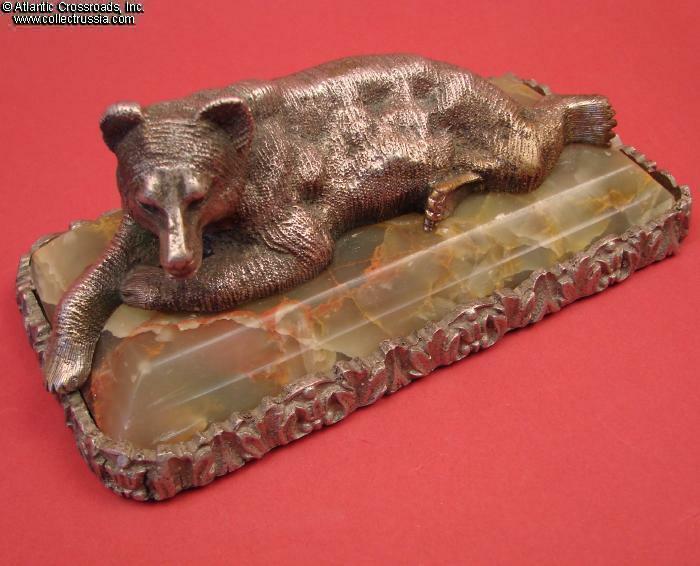 The plating on the border trim has worn through at several points but, while the plating on the bear cub has darkened from age, the bronze has not worn through on it. 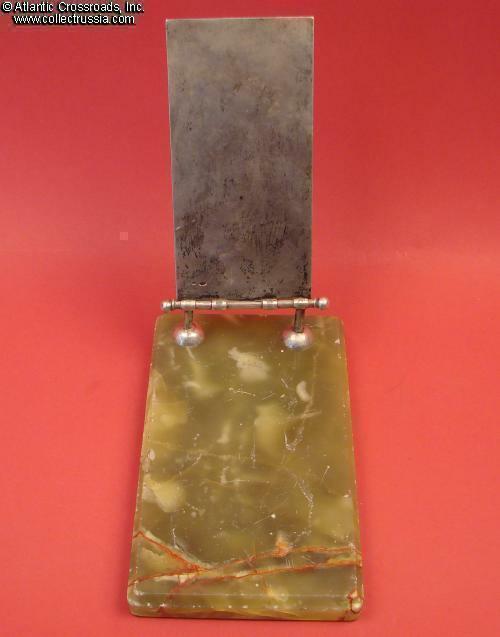 Here, too, the green, striated marble is virtually identical to that used in the other two pieces. 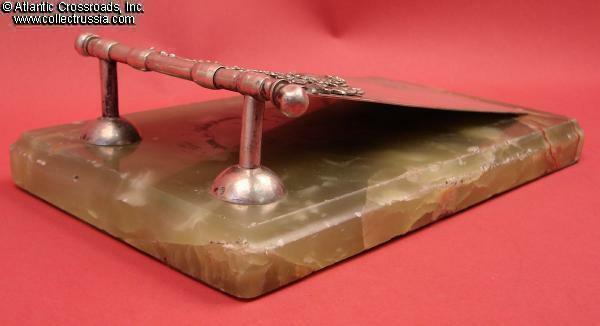 As with the calendar holder and the other paperweight, the underside of this piece has had a thin layer of green morocco leather applied to it. 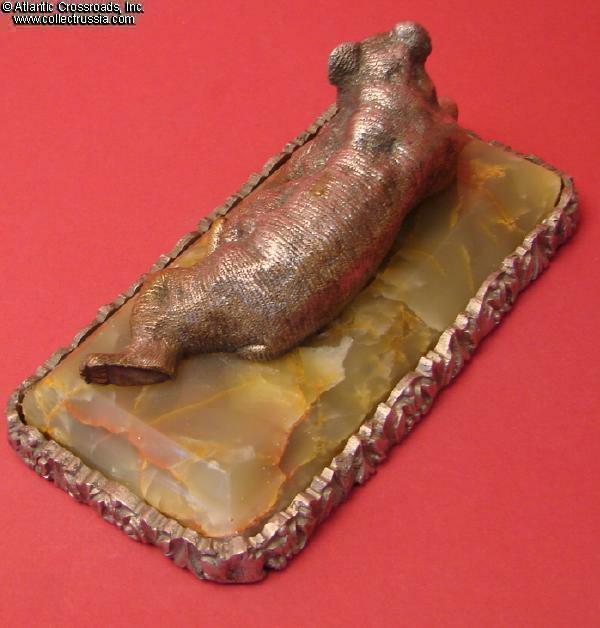 (It is possible that the leather was dyed green after it was attached or that a previous owner applied some sort of a green leather polish to it.) There is a circular impression struck into the leather of an unidentified Russian coat of arms (placed there as if to indicate ownership at one point by a specific noble family). 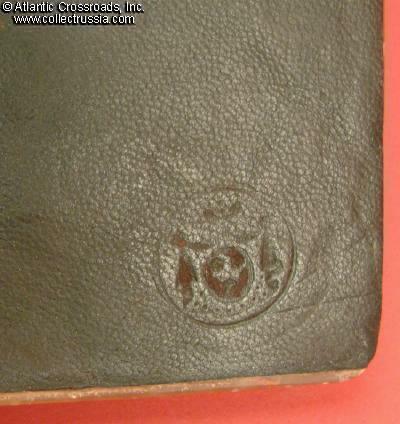 Again, it is our belief that the leather and the coat of arms imprint are not original to the piece but we can neither prove nor disprove that observation. 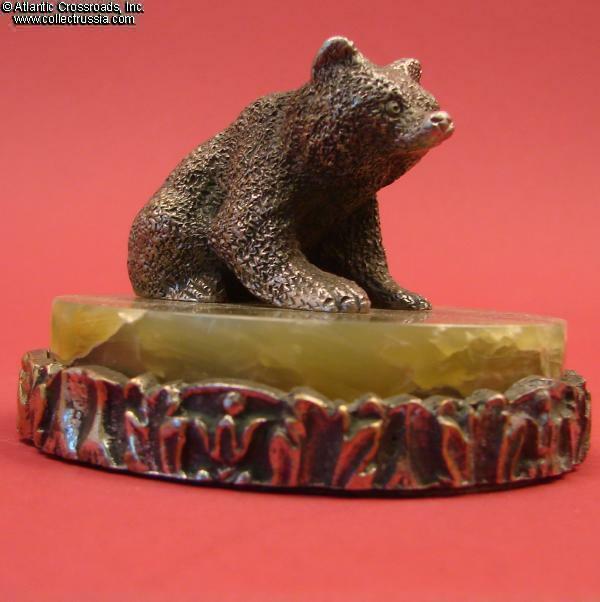 While the sculptor was quite successful in rendering a naturalistic image of a seated bear cub, you may notice that, when viewed directly from the front, the cub has a decidedly skeptical expression on its face! Compete "upper class" desk sets of the late nineteenth and early twentieth centuries frequently comprised eight, ten or even more than a dozen individual pieces, including many items that would have no use at all today in a contemporary office setting. These three artifacts, however, would easily compliment a modern desktop and would not look completely out of place sitting next to a laptop!